Open the pages of The Hunter Gracchus and step into the remarkable mind of Guy Davenport, one of this countrys most provocative writers. 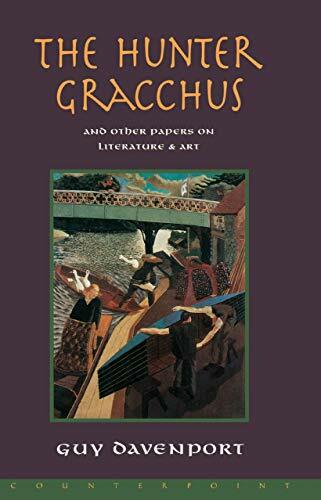 Moving effortlessly from snake handling to Wallace Stevens, these essays take delight in an immense range of topics, including art and architecture, religion, and literature. Open the pages of The Hunter Gracchus and step into the remarkable mind of Guy Davenport, one of this countrys most brilliant and provocative writers. Hardly the typical essay collection, The Hunter Gracchus is better described as a collage of ideas, commentary, and criticism from an eclectic stylist whose sentences ring with clarity and originality.Moving effortlessly from snake handling to Wallace Stevens, these essays take delight in an immense range of topics, including art and architecture, religion and literature--all approached from Davenports deeply personal point of view. In one essay, Davenport recalls a lunch with Thomas Merton at the Ramada Inn, where Merton, already the worlds most famous Trappist monk, drank several martinis and held forth on the architecture of Buddhist temples.